An evolution. Good work often reveals itself slowly. On the 2nd January 2018 I painted this ghostly winged figure. I had recently finished reading Skellig, by David Almond. Keira recommended the book to me, and one of the characters is a mysterious winged creature, so I think that’s partly where the inspiration for this art came from. The book and its sequel, My Name Is Mina, are both excellent reads. The greeny blue one on the left and the red spattered one on the right were both hidden as part of the free art project, and I made the orange piece in the centre during an LnDcowork at Herman Miller’s showroom, where it was subsequently bought by a lovely friend. The two gold pieces are available to purchase, so if either or both takes your fancy, please let me know. A small but important modification then occurred, after Carole suggested to me the figures would look better without feet. I followed her advice and another free art drop piece came into being. Unusually – I was in the vicinity when this piece was found. Someone pulled up in their car and dashed to grab the art. They were in such a hurry to find it, they’d not put any shoes on before leaving the house. A shoeless person found the footless angel. I love this piece of work, I think it’s one of the best things I’ve painted to date. It has just returned from the framers and is ready, as one of three pieces which will be shown in March 2019 at an exhibition in Minden Germany. All of this work emerged in a period of a few weeks. It was feeling good to make, and I still wasn’t really sure why I was enjoying the work so much, or why I felt so strongly compelled to keep going. In March 2018 I attended Workplace Trends, both to live paint at the event, and give a talk on why creative practice at work matters. As I put together my pop up art studio at the back of the room, I listened to Nicola Gillen speak about psychological safety at work. I wrote about how Nicola’s talk inspired me here, and I started to paint the design you see below as a result of what I was hearing. The winged creature indicates a guardian within – open arms encouraging that sense of being sufficiently confident to speak truth to power, to be ‘myself’ at work. I painted a lot that day, and the piece inspired by Nicola subsequently went on loan to the London offices of AECOM, where it spent a few months in reception, before being sold. I am continuing to work with these winged creatures, which are evolving to represent aspects of mental health, taking responsibility, and wellbeing. The circular centre piece below is titled ‘Waiting To Hold You’ and is also heading to Germany soon. In addition, I’ve made several smaller sketches, and will continue to develop the project, titled ‘I Guardian’ for as long as it interests me. At a time when people seem to crave things, faster, now, even sooner than now, I wonder: How often do you give yourself time to start, dip in and out, and keep returning to an exploration like this when at work? Good work often reveals itself slowly. I’m disappointed by the decision. I wouldn’t have submitted the work if I didn’t think it was worthy of inclusion, and it isn’t, and that’s OK. I’m pushing my artistic practice pretty hard right now – making more works live in front of audiences, making larger works, experimenting. To some extent, the goal of submitting to the RA is part of what drives me on. The Gathering remains a piece I am proud of – it was exciting to make, and having it freed up by the RA means I can now offer it elsewhere. This rejection is just another step on the adventure. Congratulations to Anne McCrossan, a lovely friend who did make the short list, I’m delighted for you. Yesterday morning, I dropped ‘Thank You For Letting Me Be Myself Again’ off at the London headquarters of AECOM, where it will be on display until the end of April. You can read the background to this piece here, and hopefully you’ll see why this is a great place for this art work to reside for a while. The timing of this particular art drop was a great antidote to the letter I received earlier. Thank you to the people at AECOM who are making this possible. Last night I played at the Project B open mic, hosted by Chloe Ray. I first met Chloe a little over a year ago when we collaborated on a joint art/music project called ‘Not Giving Up’. Not Giving Up is the title of the fourth track on Chloe’s Reprise EP, and it’s the title of this artwork, made to celebrate the 50th consecutive week of the free art project. Serendipitously, Chloe performed Not Giving Up last night, what a joy it was to hear that song, and reflect on a day of rejection and acceptance. Now, if you’ll excuse me, I’ve got work to do. Back in February 2016, the Art for Work’s Sake project was a finalist in the Learning and Performance Institute’s annual awards, innovation category. 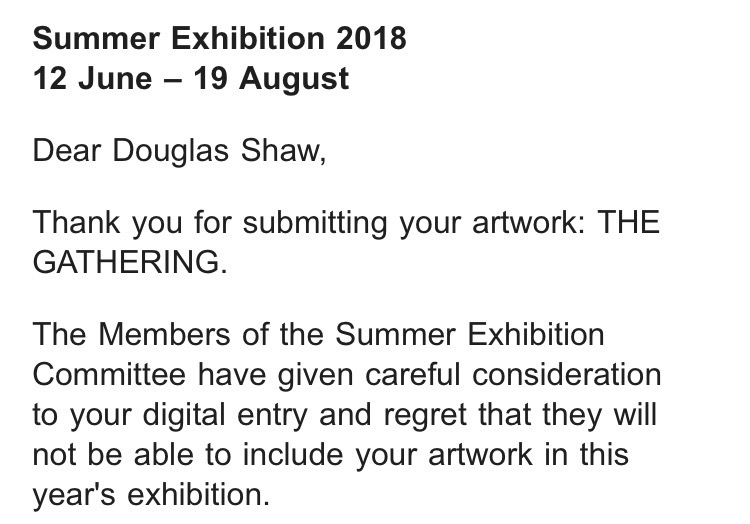 The entry fell at the final hurdle, and though I was up against some much bigger hitters, at the time I was disappointed to remain a finalist, not a winner. The LPI gave me a piece of glassware to acknowledge the journey – and after putting it back in its box on the evening of the awards, it has remained there. Until today. Today it’s on display in my office. I realise I let my disappointment cloud how I feel about my work, and for a while, I backed away from the excitement, challenge, and everything which makes me and my work what it is. I guess I lost some confidence, retreated to safer territories. The trouble is I don’t like safe. In my line of work it’s boring, it’s waiting to be told what to do instead of figuring it out, it’s coercive not coactive, and it’s overcrowded. David Henry once shared with me an excellent Tom Fishburne cartoon which sums things up nicely. With a little help from some friends, I’ve been working my way back out of the herd again. Running workshops, giving short talks at conferences, piloting new ways of working with clients. Each piece of work, building on the last, a blend of care, preparation and the all important improvisation. The willingness to say ‘yes, and…’. The excitement of having a basic script, and being completely open to tearing it up. To go with the flow, to the uncharted territory where the really interesting and useful stuff lies. This adventure is back on track, and very soon I’ll share details of the first phase of The Art of Innovation, a collaborative and practical adventure blending organisational development, the employee experience, and art. It all kicks off in London and Berlin this summer. The middle of March 2017 marked the 50th consecutive week of my free art project. This milestone was celebrated with a joint free art drop made by Chloe Ray and me. Chloe released her latest EP the same week as the art project turned 50, and I made a painting to reflect a song on the EP titled ‘Not Giving Up’. The canvas is 80cm x 30cm and this is the first time I’ve painted at this scale. I’ve been wanting to scale up my work for some time, and having done so once, within 24 hours of painting this piece I did it again. 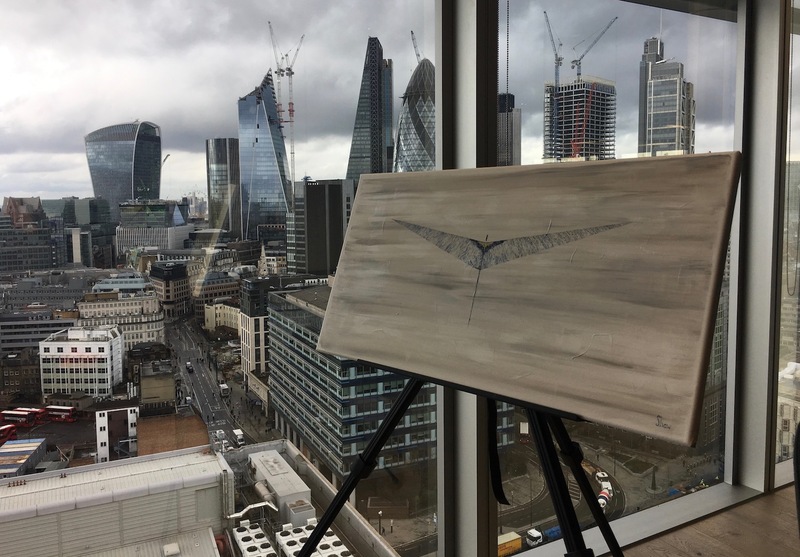 This time I painted an abstract of the view over London from the 34th floor of the BT Tower. It’s taken me years to find the confidence to paint and show my work at this scale, I’ve persisted with my work – clearly the time is now right. A few weeks ago I was encouraged to apply to Arts Network Sutton for some grant funding to enable me to carry out some workshops, an exhibition, and other free art related activity in the coming year. I’ve just found out the application has been successful. This application wouldn’t have succeeded if I hadn’t stopped thinking about free art, and started making it, all those weeks ago. Looking back – I can see threads of the free art project in my work which snake back way before I started painting and giving art away. I have shifted from persistence of thought, to persistence of action. I’m good at coming up with ideas, and I used to think I was rubbish at bringing these ideas to fruition. This clearly is not the case. Maybe all I’ve been doing for the past 51 years, is searching for the things which really excite and drive me in the service of myself and others, the ideas which matter, which resonate deeply. For too long, I’ve been searching for the next big thing, when the signs are right in front of me. This artistic approach to work is where I am most alive, and where I can be of best use to myself and to you. I think I am the primary audience for this post, so if you’ve read this far, thank you and well done!